In India, there are three streams available for students to choose from after Class 10 – Science, Commerce and Humanities. Understanding in detail what each of these streams has in store for you in terms of subjects, syllabus, difficulty level, and career options is the first important step toward making an informed choice. 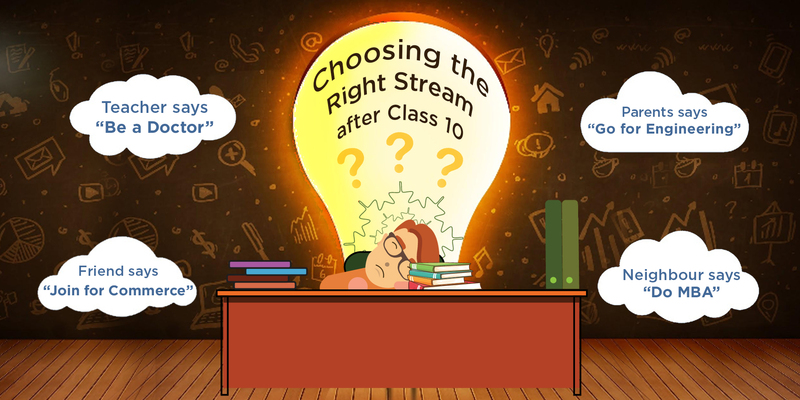 Research the options that’ll be available to you after completing Class 12 in each stream, go over the textbooks to understand the curriculum, talk to your seniors to learn about the pressures of each stream. Make comparative notes about pros and cons of each stream and analyse them before making a choice. Any stream you choose can put you on the path to success provided you have the aptitude and the right skill sets to pursue it. After all, it is better to be an excellent banker or historian than a mediocre engineer. So reflecting on your own strength and interests is a non-negotiable part of the decision-making process. Evaluate your performance and scores in different subject and honestly assess which subjects you enjoy studying the most. Rank them in the order of preference and compare them with your notes on the pros and cons of each stream. If say maths and science rank among the first three and science is your preferred choice of stream, you are good to take the plunge. However, if those dynamics are inverted, it may be a good idea to consider commerce or humanities. A lot of people, including your family and mentors, will suggest that you take up medical or non-medical and see if you are able to cope with it, reasoning that you can always choose a different course after Class 12 if it doesn’t work well. However, you’ll be starting out on a wrong footing and setting yourself up for disastrous results academically. It will definitely reflect in your Class 12 board results and compromise your chances of getting into any premier institute, considering the abysmally high cut-offs in most reputed colleges. You have nearly two months to decide on a stream after your Class 10 board exams. If you really find yourself struggling to arrive at a conclusion, consider taking help from a professional career counsellor. They are trained to analyse your personality traits, strengths and weakness to make a concrete suggestion and back it up with logic. Make sure you involve your parents in the process, so that you are all on the same page about this all-important decision. Once you have made up your mind about what you are going to study after Class 10, don’t let conflicting opinions sway you. No matter what you choose, there will always be someone telling you to do otherwise. Keep reminding yourself that you are the best judge of what works for you, and stick to your decision. The ability to stand by your own decisions will stand you in good stead in the future too, so now is the best to cultivate this personality trait. CAT vs GMAT – Which is Right for You?